The publication of peer review is not a new idea, but it has yet to become widespread among journals in the life sciences. We’ve compiled here reports from journals with experience with this practice. If you have any additional questions or contributions, please email jessica.polka@asapbio.org. How is the publication of peer review reports related to "open peer review?" In this FAQ, we will focus on open reports, meaning that the contents of peer review are published alongside the article, with or without the reviewers’ names. Which journals publish peer review reports? Publons maintains a list of journals that allow them to display peer review information, though what information can be displayed varies. However, this is not a complete list of all journals publishing peer review reports. TRANSPOSE is a new initiative that provides a framework for collecting journal policies on open peer review, co-reviewing, and preprinting. Contributions from anyone are welcome. Will authors be reluctant to submit to a journal that publishes peer review? At The EMBO Journal, which publishes peer reviews anonymously, editors did not see a decline in the submission rate after introduction of this policy; furthermore, only 5.3% of authors opt out of publishing the peer review process file. At eLife, articles are published along with the decision letter and the authors’ response letter. Initially, authors were able to opt out of publishing the decision letter and response, but so few chose the opt out that the letters are now always published. The journal receives over 600 submissions each month. Forty-four of the sixty-eight BMC series journals operate open peer review as standard (not optional). The journals have not received any negative feedback from authors about this. A study published in BMJ Open in 2015 analysed peer review reports in BMC Infectious Diseases compared with BMC Microbiology, as well as in the Journal of Inflammation that had changed from signed, published peer review to single blind peer review. Author satisfaction was higher for BMC Infectious Diseases compared with BMC Microbiology, including the response to the question regarding the helpfulness of comments from peer reviewers. In the Journal of Inflammation, there was no difference in author satisfaction between the periods of time when the journal operated on open or single-blind peer review. 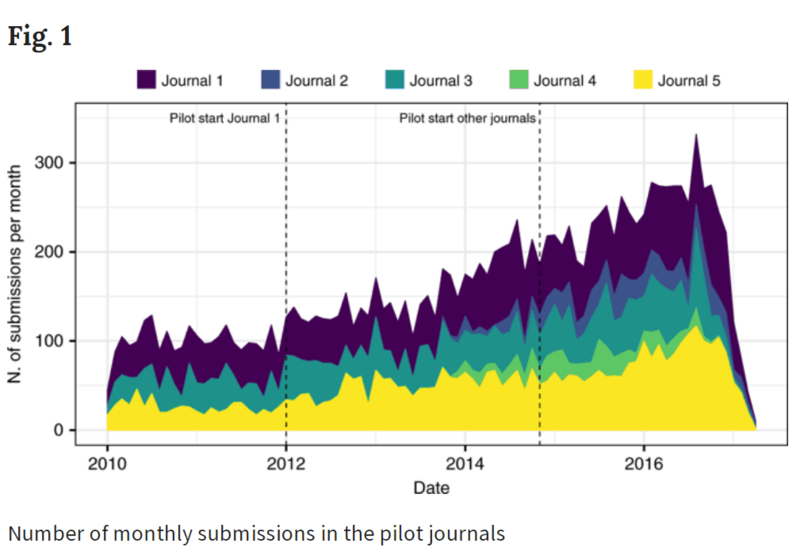 In a trial of 5 Elsevier journals that piloted published peer review (with optional signing), all journals taking part in the pilot showed an upward submission trend. 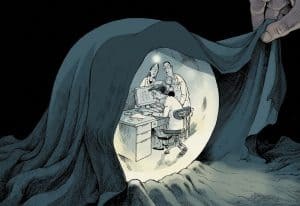 Will reviewers be reluctant to perform peer review if it will be published? The EMBO Journal reports no difference in reviewer acceptance rates. European Journal of Neuroscience found that only 18 out of 3293 invited reviewers declined because of their (signed) transparent process. 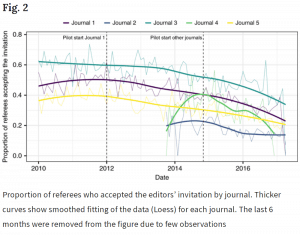 In a trial of 5 Elsevier journals (published review, optional signing), the rate of reviewers’ acceptance to review declined from 43.6% to 30.9% during the pilot across all the journals. 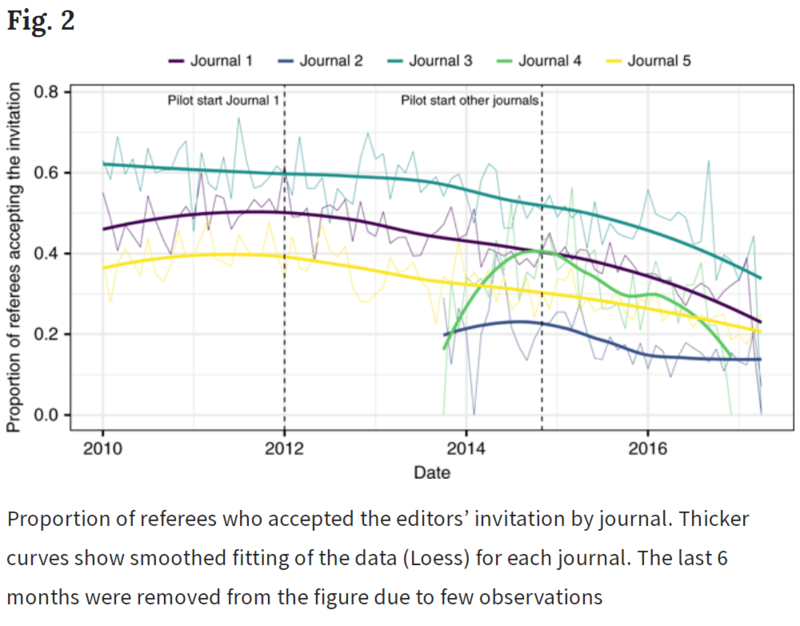 However, the global rate of acceptance of review invitations is also declining; the study authors’ modeling & comparison to other journals suggest this is independent of review openness. For the BMC series journals there is some evidence to suggest that reviewer uptake is lower due to the open peer review policy of the journals. A very small number of reviewers actually cite open peer review as the reason for declining, but editorial board members for some journals have said that they sometimes have difficulty recruiting reviewers for this reason. In a study comparing acceptance of peer reviewer invitations by peer review model: (open, single-blind, and double-blind) the proportion of accepted invitations was lower for open peer review journals (42% compared to 53% for single-blind peer review journals). As a result, for journals with open peer review models, a higher number of reviewers may need to be invited. Will the quality or rigor of the reviews change? In a randomized controlled trial conducted in 1999 to 2000, The BMJ found no difference in article acceptance rates or review quality for papers with signed and published peer reviews (versus those undergoing a traditional closed process). However, potential reviewers were likely to refuse participation in the study, and reviewers whose work would be signed and published took longer to write their reviews. 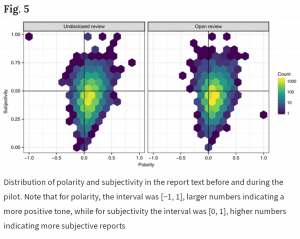 In a trial of published, optionally signed peer review in 5 Elsevier journals, sentiment analysis of reviews conducted before and during the pilot suggests no change in the negativity/positivity or subjectivity/objectivity of the language. In this study published in BMJ Open, the main findings were that the quality of peer review reports was slightly higher in BMC Infectious Diseases (publication of signed peer review) compared with BMC Microbiology (single-blind peer review), but there was no difference for the signed & published versus single-blind review in the Journal of Inflammation. These results suggest that it may be advantageous to use open peer review but they do not undermine the validity of using the single-blind approach. Has publishing peer reviews impacted editorial decisions? What are reader interest levels in published peer review reports? At The EMBO Journal, peer review process files receive about 10% of the hits as the papers themselves. In the Elsevier pilot, ⅓ of visitors clicked through to the peer review reports. Nature Communications reports that “reader engagement in the reviewer comments […] is difficult to assess. We have received some technical comments on published articles that refer to the Peer Review File, indicating that they find it useful to gain a deeper understanding of the paper and stimulate discussion (see here for example). Have peer review reports been used as “ammunition” to criticize individual authors? Have political opponents of a particular type of research used peer review reports to undermine trust in science? Nature Communications reports that this has not been seen at the journal. How have authors benefited from published peer review? How have readers benefited from published peer review? “Perhaps the most influential aspect of the exercise, called the Reproducibility Project: Cancer Biology, has nothing to do with those arguments. It lies beneath the surface, in the peer reviews of the project teams’ replication plans, which were published before the studies began. These reviews can be read as part of the editorial decision letters linked to each replication plan, or ‘registered report’ (see go.nature.com/2jte08a). What are technical best practices concerning publishing peer review? On October 17. 2018, a group of journal and infrastructure representatives published a workshop report containing recommendations to JATS4R on article and metadata structure for pubilshing peer reviews.